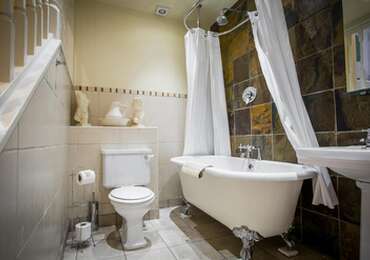 The Tennant's Arms is a traditional country pub with boutique hotel rooms. We are situated in the heart of the Yorkshire Dales National Park, in the beautiful village of Kilnsey, nestled beneath Kilnsey Crag with spectacular views over the Dales countryside. The pub was once an important coaching stop on the busy route from Richmond to London and retains much of it?s authentic rustic charm. Come and celebrate your Special days with us in our beautiful oak function room which can provide seating for 20 and is perfect for private family parties. It's a place to take time out and relax, enjoy a pint in passing, take delight in a pub meal or stay over in one of our boutique rooms. We are not far from local market towns, Grassington, Skipton &Bolton Abbey with easy access to all the activities and attractions that the Dales have to offer. We aim to provide quality, home cooked, locally sourced British food, a good range of local cask ales and fine wines all served with the warmest of Yorkshire hospitality. We have a great beer garden for those summer afternoons and evenings and cosy real fires to warm you in the colder months.